Noticing that Olympic lifters usually squatted with elevated heels, I realized that their backs were much straighter than a powerlifter's back generally is. The raised heels and straight back employed by Olympic lifters was obviously placing a greater strain on the legs. I also determined that the muscular development of the Olympic lifter around the knee area was more prominent than that of the powerlifter. The reason being most powerlifters neglect this region of the thigh in their workouts. The powerlifter usually has better developed hips and upper thighs, because the most emphasis is placed on them in a powerlifter's routines. 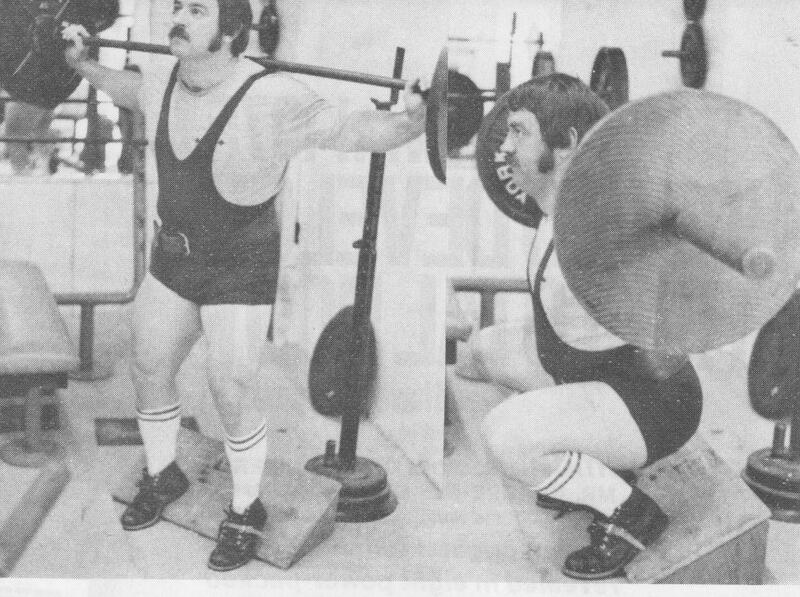 The powerlifter, to be able to squat maximum weights, has to place the bar lower on the back and lean forward slightly, while the Olympic lifter does the type of squats with the bar high on the back and maintaining a straight back, enabling him to develop the strength needed to rise from a low squat clean position. These two slight variations will, as I mentioned before, produce thigh development and leg power in direct opposition to each other. The point I'm trying to make is that each group of lifters should devote a little extra time to work the area in which they have a definite weakness. The Olympic man could include some power squats in his routine, and the powerlifter could work on the Olympic style squat for that "added something" that they both could use. Being a powerlifter who wished to increase my overall leg strength, as well as the physical development around the knee area, I began to experiment with an Olympic type of "heels on board" way of squatting. First, I tried a two-by-four that had been lying around the gym collecting dust. This is what the Olympic lifters generally had used in their squat programs. However, after a few workouts I felt I needed added board height to more effectively work my knee area. Next I tried a four-by-four, but immediately ran into trouble with the extreme angle the board placed my feet in. It just put too much pressure on the arches of my feet. So I decided to saw the board in half diagonally, with not just comfort in mind, but placing maximum resistance on the lower muscles of the thigh. It worked great and I began to notice improved development around my knee area, plus I was adding weight to the bar every leg workout without strain or pain. Occasionally, during a leg workout, as I stepped back to do my squats on the four-by-four, I would accidentally kick it over backwards. Rather than messing around with the sometimes clumsy piece of wood, I devised a small incline board out of plywood with a larger base to stand on (see photos). This was perfect for me and by type of leg workouts, so I dubbed the new exercise "The Incline Squat." The incline squat is a great change of pace exercise, as well as a tremendous lower-thigh size and strength developer. If you want to incorporate it into your powerlifting routine, let me first explain how to properly perform the exercise. As you adjust yourself, under a light weight at first, be sure to place the bar high on the traps of the upper back. Step back onto the incline board, placing the feet close together (approximately 10-12 inches apart). Controlling the weight, with an upright posture of the back, descend slowly and go down as far as you are able to. This will really stretch the muscles, ligaments and tendons around the knee area, so be sure to use a light weight at first, don't bounce out of the bottom, and work into the heavier poundages gradually. With the elevation of the heels, you will notice a difficulty in completely straightening the legs and locking the knee joint. This is quite natural, and you shouldn't worry about losing your balance during your first attempts at squatting on the incline board. As a matter of fact, I've found that the inability to straighten out the legs completely while incline squatting is a definite plus, rather than a minus. If forces you keep your balance with knees bent, which means that while you are fighting to stay on the board, the knee area of the lifter is waging its own battle against the everpresent resistance of the barbell. This extra "battle" might not seem like much, but you'll be surprised at the muscular development and strength that you will derive from this fight to keep your balance with the knees bent. It can also be beneficial to your incline squat progress if you have a spotter stand behind you and slightly pull you back with his hands, as you come out of the bottom position. This method of spotting will allow you to maintain an erect stature, forcing the thigh muscles to do the majority of the work, instead of the back muscles carrying the load. The number of incline squat repetitions that you do can vary, but I prefer 8-12 reps, followed directly by as many reps as I can muster after stepping off the incline board. 8-12 hard reps on the incline board, step forward off the board and gut out as many reps as you can. Usually I can tell when to step off the board because I start to lean forward too much while performing the incline movement. The stance used for the last (off the board) sequence of squats can either be wide or regular. Just try to select a stance that will allow you to go down as far as possible, and as I mentioned earlier, do a lot of repetitions. This should thoroughly work the quadriceps, in large part the vastus internus muscle located just above the knee joint. That's what the incline squat is all about, and remember, you don't have to use an overly massive weight to do this. A fellow powerlifter once told me after having done the incline squat for the first time, with 155 lbs.) that didn't realize 155 could be so heavy! And at the time of that statement this man was capable of well over a 500 lb. squat. I might also add that this lifter, after working on the incline squat for a time, increased his leg measurement just above the knee quite considerably. You don't necessarily need spotters to do this movement. Just select a weight that will produce the desired effect, one that you can 'good morning' out front, or dump behind off your back, if you do happen to get stuck in the bottom or lose your balance. Since leaving the forest Path Finder had been leading a way which grew steadily higher and more demanding. Though he was tired, The Kid maintained the older man's pace. He was becoming tougher. Aware of his improved endurance, a new question crossed The Kid's mind. 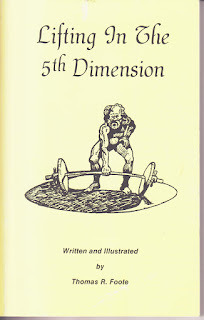 Just how long had he been struggling through this outlandish 5th Dimension? Had it been hours, days, weeks . . . ? There was something dreamlike about the whole experience. He could certainly feel that time had passed. It wasn't his imagination which hurt just now; it was his feet! Something else he noted, trudging those aching mountain miles: his shadow didn't jiggle around the edges the way it used to. "My gut," he thought and gave himself a critical pinch, "is more firm. And my arms and legs are tighter. Holy dumbbells!" he gasped. "I might even learn to enjoy this self-abuse." Rounding a corner revealed the trail leading toward a distant, high pass. Presumably the fabled Shambala lay in-wait just beyond that very pass. Previously, when pressed for their journey's goal, Path Finder had answered "Shambala." But the guide had remained vague about details of the destination. This is a large land, he would say, and not well charted. Like the stories about The Garden of Eden, Path Finder said mankind had turned its back on the fertile promise of Shambala. Instead they had wandered a long downward path into fragmentation and ignorance. Now that once might city waited, its towers and walls abandoned to wasting ruin. The path forgotten. When Path Finder talked about Shambala he was always very solemn. The Kid had to admit that what the old man said didn't always seem to "compute". He couldn't tell whether the old man was retelling a fable or recalling an actual memory. However, he trusted the guide and could feel his serenity. At such times The Kid was persuaded by a physical sensation of trust. As the trail rose it squeezed into a narrow defile. Rough rock walls tried to swallow it. This narrow pass had resulted from the gluttony of two glaciers! While making slow meals of the mountain, they had passed back-to-back up opposite sides of the crest. Now a sharp, saddle-shaped summit offered only one route, and it was blocked! A great tree had relaxed its ancient grasp on the mountain and plunged into the narrow mouth of the pass. With Path Finder, The Kid approached the blocked passage in silence. Frustration and hope swirled within him like a storm. Shambala was so close. He could FEEL it! Like a childhood memory of endless summers, he could recall the glowing silhouette of the prized city. Suddenly, The Kid grabbed the snag and heaved it out of the way! The tree tumbled and smashed down the slope, kicking up rocks and showering splinters. "You're out of your mind," gasped Path Finder. "Finally!" "What'd I do?" The Kid said, shaking his head as if just coming awake. He continued in a whisper, "I know it doesn't make logical sense. I mean, I know - er, think -- I can't lift trees. But I just felt this urge to do it -- and did it!" "It's okay," the old man smiled. "You just let your body make the decision. You'll get used to it from here on."
. . . With that they passed the mountains crest and started the homeward trek. The Kid, still shaking his head in consternation, seemed not to notice that he, not Path Finder, led the way down the trail. The old guide had subtly given ground to the younger man. Even with the swelling certainty that their long journey's goal lay within reach, The Kid felt overwhelmed with the need for a rest. "Path Finder," he called over his shoulder, "let's take a break. Tossing trees around seems to have caught up with me." "Fine," replied Path Finder agreeably. "You've earned it. In fact this looks like a remarkably fine spot to rest. Very peaceful." His guide's voice seemed to have taken on a hypnotic quality. It was all The Kid could do to relax his aching frame. "Peaceful" seemed to echo within his head as he eased back against a large tree and stretched his legs out before him. His head sagged forward in a long journey, until his chin rested upon his chest. Peacefully. The Kid had stumbled upon a profound truth. The body can participate in decision making. Now don't jump to any premature conclusions about my sanity by pointing out that you know when to eat because your stomach "growls". Certainly the physical cues signaling appetite exist, but they are like a voice crying in the wilderness. If culturally, we are not deaf to this voice, how can you explain the remarkable success of diets? There was a zen master whose measure of enlightenment consisted of how to "eat when hungry and rest when tired". Were such simple harmony of need and action commonplace, it would never have become preserved in parable form as a measure of "spiritual" awakening. Presumably an integrated self which experienced the body's participation in decisions would know when to eat, and how much, and what. Certainly the body would not ask to be poisoned with alcohol, processed food and preservatives. So, you see, there is really much more to this than listening to your stomach growl, then proceeding to grab some beer and potato chips while you sink down in front of your TV and watch two teams of other men exercise. There are undoubtedly other ways to describe what I experienced last night, but subjectively there is no other description I can offer. Walking past a homemade barbell (bought for five bucks at a yard sale) I had the urge to deadlift it. This barbell, which had been spray-painted an outlandish gold, was a fixed weight of about 265 pounds. After a millisecond's delay my head said, "Don't bother you fool, who needs it?" From somewhere a different voice urged, "Follow that first feeling; it has hidden integrity." Well, I stopped and hoisted it a few times. The result was weird! I felt a little euphoric, calm, maybe smug, but definitely good! I had let my body make a decision. It was a different experience and it was the beginning of the end of the absolute tyranny of the brain. That close encounter with the homemade barbell was a pivotal experience. Afterward, other things started to fall into place. A new "way of knowing" was beginning to emerge. Many have been times when the firm, familiar feel of resistance translating up the bar through muscle and bone has unmistakably said, "Welcome home." Here is something you can understand, an inner voice would reassure me. With each movement of my body, a calm spread to encompass limits beyond the flesh. When that was written I didn't recognize the body speaking. I was getting there, like The Kid nearing the pass, but the noise in my mind was still too loud. My balance had been disrupted. Before that five dollar barbell encounter I didn't realize that the body could "know" something better than the mind. I didn't know the body could have its own reasons. But once you've heard the body speak, you will never be the same. Slowly, I became aware of a Body-self in addition to my Verbal-self. The pronoun "I" developed two points of reference. There was the Verbal-I and the Body-I. Previously, "I" had only referred to a verbally dominated identity which thought it could own the body, hence, the phrase "my body". With increased awareness, the possessive structure in our language seemed inaccurate. I needed a way to refer to the body-identity that would place it on equal footing with the more common, verbal self. I finally settled on the term "Bodi". And just how does one learn to hear the voice of the Bodi? To begin with it helps to lose your mind. Do you remember the expression, "lose your mind and come to your senses"? I first read it on a button in the Sixties before personal philosophies were written on T-shirts. That button said it all. Something must have been missing though, because it didn't change the world. For one thing, slogans are a distinctly "verbal" experience, while coming to your senses and hearing the Bodi speak is a "transverbal" experience. It transcends the verbal. One must physically come to terms with the Bodi. Life is not an abstraction and the journey of understanding is not a head game. Learning to hear the Bodi and allowing it to participate in decisions is part of the larger task of becoming a whole and well being. Once I walked out of a restaurant restroom and saw "THE ANSWER" written in letters two feet high. Above the service entrance to a gas station across the street, big, shiny, red-plastic letters read "SELF REPAIR". Back inside the restaurant (it was small and had an outside restroom), I wrote those words on a paper napkin. Portents and signs from the gods, I figured. Those plastic words were an omen. We, the cells of the human body, in order to form a more perfect union, establish justice, insure somatic tranquility, provide for common defense against the brain's tyranny, and promote general well-being do ordain and establish this Bodi Bill of Rights. The heinous brain shall make no law which prohibits the bodi from full and equal participation in all decisions. Article Two . . . I have often wondered if there were a kind of background hum that one might experience at such times which would indicate life simply coursing through us. Mystics write about something similar when they rant about "pure consciousness". Shouldn't the bodi have an equivalent expression? Of course it should, and it is that elusive background hum of our great plasma engine. Through your lifting you can communicate with the Bodi which is essential to balance in our verbally dominated culture. In a way, the Bodi is equivalent to a "physical mind". The sense it makes is very primitive. Earlier I used the term "transverbal" to describe communication with the Bodi. Perhaps a more accurate description would be "preverbal", which means "before words". This is a process of getting back to basics. The funny thing is, you cannot expect to listen for the voice of the Bodi the way that you hear thoughts from your verbal mind. The Bodi's roots predate the verbal mind. You must learn to "feel" the Bodi speak. Practice makes perfect. At first the Bodi's voice is weak. You must become alert and pay attention to fine details. I am not referring to simplistic feedback from the viscera and muscles. I am suggesting a primal sense for the right action which should participate in decision making. The Bodi speaks, though we have tried to suppress it. I am reminded of an image from my childhood. I remember a new asphalt parking lot that was added to a grocery store near my home. Paving over a venerable old orchard was considered "growth". My bare feet remember that black expanse. It was so hot! One day, when I was catching grasshoppers, I witnessed a miracle. Pushing up through the hard, sticky surface of that parking lot was the bent and twisted head of a plant. Deformed by pressure, yet green and full of life's juices, an irrepressible weed had thrust its way to sunlight. Down on my hands and knees exploring that wondrous sight, I was seduced by ancient forces. Forever after I was to remember that event as a triumph of the old gods, of shamans and druids, over progress and technological advance. I have resisted labor-saving devices and am suspicious of "high-tech". Like that weed, the voice of the Bodi may be suppressed but it is there straining for recognition. Though we surround ourselves with air conditioners, elevators, cars and pills, the Bodi persists. Its voice is action. Use it or lose it. Once you sense the reality of the Bodi, allow it to participate in decision making. It will grow. After years of being devalued, the Bodi will become more bold. As this new voice grows louder, you will benefit. The voice of the Bodi conveys a special sense of "certainty". It is common in esoteric literature to see a distinction between "Thinking" and "Knowing". The former reflects the tunnel-blindness of the mind operating alone, while the latter is meant to distinguish a special holistic experience. The holism of some mystics seems to be a joining of their limited consciousness with a more universal mind. To me, this sounds like more of the same. Wholeness is not more mind, it is the integration of body and mind. Reliance on the mind alone leads to absurd blind alleys. I have a fantasy which demonstrates what I mean. Imagine a classroom filled with eager, open faces. It is an introductory philosophy course. The professor feeds the students a common paradox. "When an arrow shot at a tree," he says, "has traveled half the distance to its target, the remaining distance may again be halved. And so it goes, ad infinitum. The arrow never reaches the tree because it always has one half of the remaining distance to travel." Triumphantly the professor concludes. He scans the audience for faces showing signs of sudden conflict. He spots me! I've read that all paradoxes are apparent rather than actual. That is, they can only have a problematical existence. In the real world of experience there are no paradoxes. The Bodi knows everything works out. As my fantasy continues, I rise from my seat and approach the professor. Grasping the startled man by the throat with one hand, I draw the other hand back in a fist. "Professor," I say quietly, "I want to put your story to a test. Let us wager that my fist will never encounter your nose." This fantasy probably tells you a lot about me, but it also demonstrates a much overlooked source of knowledge, that is, the direct knowing of concrete experience. Life is not just a head game and I'll bet that professor would agree! I also bet he would decline to test my hypothesis. For years I was a self-help junkie. I thought "the answer" would be contained in some book or books of wisdom. So I read. And read . . . and read. Eventually I discovered some bits of truth, but I found them in the weight room rather than between the covers of a book. The answer I sought turned out to be a body trip, rather than a head game. LIFE IS AN ANSWER TO BE LIVED.